Eddie Adams, a famous American photographer, received the Pulitzer Prize for this photograph which he took, in Saigon, on February 1, 1968. He was haunted by the impact that it had on people in America and around the world. Shortly after the North Vietnamese communists launched the Tet offensive on January 30, 1968, fighting broke out in the U.S. Embassy compound in Saigon. Associated Press photographer Eddie Adams saw two South Vietnamese soldiers escorting a prisoner through the streets of Saigon. With his camera, Adams captured the exact moment that South Vietnamese National Police Chief Brig. Gen. Nguyen Ngoc Loan executed the Vietcong officer on February 1, 1968. For Loan, the shooting is an act of justice: The Viet Cong lieutenant had just murdered a South Vietnamese colonel, his wife and their six children. The American anti-war movement adopted Adams’ photograph as a symbol of the excesses of the war. But for the rest of his life Adams was haunted by the photo and felt it was misunderstood. There's more to this story, however. 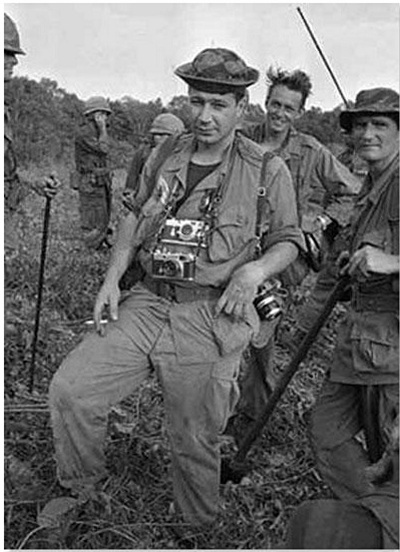 Eddie, seen here in Vietnam during 1965, became friends with the General. After General Loan moved to America, and opened a pizza-shop in Virginia, he and Eddie kept in touch. When people found out that the shop-owner was the shooter in the famous picture, Loan had to close his shop. Individuals who didn't really know him (or the facts about the shooting) equated the pizza-maker with someone who had killed an unarmed man at point-blank range. But ... there's even more to the story than the friendship which developed between the photographer and the general. When his photo was used as an anti-war tool by people who did not know him, Eddie Adams knew that his Pulitzer-winning picture only told half the story. Photo observers weren't told about the crimes that the person in the photo, who was about to die, had committed against others. The person whom Loan killed—Nguyen Van Lem (also known as “Bay Lop”)—was not an innocent man (even though he didn't have a weapon on him at the moment he was shot). He was not a person who just disagreed, politically, with Loan (although he did). He was a man who had murdered innocent civilians, including children, not long before his own death. The AP photograph, depicting the bodies of Bay Lop's victims, was not laid side-by-side with Eddie's photo everytime "Saigon Execution" was published. People didn't know "the rest of the story." I won a Pulitzer Prize in 1969 for a photograph of one man shooting another. Two people died in that photograph: the recipient of the bullet and GENERAL NGUYEN NGOC LOAN. The general killed the Viet Cong; I killed the general with my camera. Still photographs are the most powerful weapon in the world. People believe them, but photographs do lie, even without manipulation. They are only half-truths. What the photograph didn't say was, "What would you do if you were the general at that time and place on that hot day, and you caught the so-called bad guy after he blew away one, two or three American soldiers?" General Loan was what you would call a real warrior, admired by his troops. I'm not saying what he did was right, but you have to put yourself in his position. The photograph also doesn't say that the general devoted much of his time trying to get hospitals built in Vietnam for war casualties. This picture really messed up his life. He never blamed me. He told me if I hadn't taken the picture, someone else would have, but I've felt bad for him and his family for a long time. I had kept in contact with him; the last time we spoke was about six months ago, when he was very ill. I sent flowers when I heard that he had died and wrote, "I'm sorry. There are tears in my eyes." Photographs tell a story about what happens at a moment in time. They are indispensable to our understanding of people, places and events. But Eddie Adams, superb photographer that he was, also understood their limitations. When he died of ALS (also known as "Lou Gehrig's Disease") in 2004—at the age of 71—Adams didn't want to be remembered for the photo called "Saigon Execution." He wanted to be remembered for the pictures he took of Vietnamese refugees, trying to get into America to start new lives, featured in his essay called "Boat of No Smiles." No one, no country, was letting the refugees land. You couldn’t even find out about them. At first, I went back and said the story was impossible to cover. Then I had an idea and got in touch with the Thai Marine police (I knew Thailand very well) who had been shoving the boats right back offshore to certain death. I told them I would like to go with them on patrol in the Gulf of Siam. They OK’d it, so we headed for the most likely point in northern Thailand, getting there at 4am when a refugee boat had just pulled in; the Thai authorities were getting ready to cast it off again. It was Thanksgiving Day in 1977. I suddenly asked the Vietnamese if I could go with them— I bought gas and rice – they had no fuel or food. There were forty-nine people aboard that fishing boat, including children— in the hold that same day a baby was born. The Thais towed us back out to sea and set us adrift. On that boat, there was no room to lie down, so they all had to sit up straight, waking or sleeping. I cannot describe the despair. There were dramatic pictures of mothers with half-dead children in their arms but something even worse was there. Whenever you go to refugee camps in a war zone where terrible things have happened, where bodies might be stacked up, and disease everywhere, you still find children who gather before the camera with a smile. This was the first time in my life that no child smiled. I called the pictures, “the boat of no smiles.” The boat was hardly moving—they didn’t even know where to go. Then we were approached by another Thai boat with a megaphone ordering me off at gunpoint— they were afraid someone would let them dock knowing there was an American aboard. I had mixed feelings about getting off. I wrote the story and sent the pictures immediately, and they ran. Peter Arnett did a story also and a few others. Within a couple of days the administration asked the AP to present the photos to Congress. And Carter said let them come to America. The Congress had been thinking about it, sure, but the pictures did it, pushed it over. In his 71 years, Eddie Adams took many iconic photographs. He is remembered as one of the best photographers of the 20th century. Image by Eddie Adams. Online, courtesy University of Texas at Austin's Briscoe Center for American History. This famous image is NOT in the public domain. It is available, as fair use for educational purposes, under the terms and conditions set forth by the Briscoe Center. The series of lead-up photos, subject to the Briscoe Center's same terms and conditions, is online via the BBC. Bos, Carole "Eddie Adams and the "Saigon Execution" Photo" AwesomeStories.com. Sep 25, 2017. Apr 24, 2019.